The Aspen Pet Lebistro Programmable Food Dispenser by Petmate is an automatic pet food dispenser that can be programmed to feed your pet the right amount at the right time, even when you aren't there to do it. The large LCD screen is easy to read and the programming buttons make it simple to customize the feeding schedule and meal sizes that are best for your pet. It's also a neat and stylish way to keep your pet's food fresh and free of insects and dust. You can program the Aspen Pet Lebistro Programmable Food Dispenser to serve up to 3 meals daily with portion control from 1/4 cup to 3 cups of dry food per meal. The twist-lock lid will keep your pet from accessing stored food while keeping kibble crunchy and flavorful. The transparent food hopper makes it easy to see when it is time to refill and the food bowl is removable for easy cleaning. The Aspen Pet Lebistro Programmable Food Dispenser by Petmate is a convenient and reliable way to regulate your pet's meals, help to prevent overeating and keep your pet's food fresh all at once. 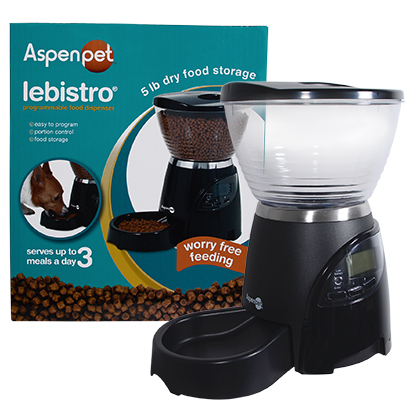 The Aspen Pet Lebistro Programmable Food Dispenser by Petmate automatically serves your pet up to three different sized meals per 24 hours. Each meal serving is adjustable in 1/4 cup increments. Both the 5 lb and 10 lb units can be set to serve meals from 1/4 to 3 cups. The default meal serving schedule is breakfast at 6:00 p.m. It requires three "D" size alkaline batteries (not included). Use only with dry cat or dog food that is 0.5" in diameter or smaller. Do not use with canned food, moist food, semi-moist food or treats. The Aspen Pet Lebistro Programmable Food Dispenser by Petmate is not recommended for puppies or kittens younger than 7 months old or pets with physical disabilities that may make them unable to reach the feeding dish. Before leaving for extended periods of time, always replace the batteries with 3 new, "D" size batteries. Do not place any foreign object in the feeder. Do not operate the feeder without the hopper and hopper lid securely in place. Do not disassemble the feeder other than the bowl, hopper, hopper lid and battery cover. Check the low battery light frequently to be sure the feeder is dispensing properly. Hopper Assembly - Align the hopper with the base on an even surface. Insert the hopper into the base and twist to lock in place. Lid Assembly - Line up the arrows on the hopper with the arrows on the lid. Place the lid on top of the hopper and twist to lock the lid in place. Bowl Assembly - Insert the bowl into the base by tilting the base and lowering the bowl into the base, connecting the hooks into the base. To clean the bowl, lift the bowl horizontally to remove it from the base and hand clean with a soft cloth. Hand dry the bowl and insert it into the base according to the instructions above. Turn the base upside down. Remove the screw and battery cover. Install 3 new "D" cell alkaline batteries matching positive and negative markings (Batteries NOT included). Replace and screw in the battery cover. Press the (-) side of the On/Off switch DOWN. Set the unit right side up with the LCD screen facing you. NOTE: Clock will flash "12:00 A.M." automatically. Press the ENTER button to set current time. First the HOUR will be flashing. Use the UP or DOWN arrow buttons to set the current HOUR. Press the ENTER button again and the MINUTES will start flashing. Use the UP or DOWN arrow buttons to set the current MINUTES. Press the ENTER upon completion. Default Meal Servings are: Breakfast at 6:00 a.m., Lunch at 12:00 p.m., and Dinner at 6:00 p.m. Follow the instructions below to change the default Meal Servings settings. Press and hold the ENTER button for 2 seconds. "MEALS" will flash. Press the ENTER button to select the Meal. a) "Yes" will flash. Press ENTER to confirm meal time. b) If you do not wish to set that meal, press the DOWN arrow to select "No" and press ENTER. NOTE: If "No" is selected, press ENTER and the software will take you back to "MEALS." Use the UP or DOWN arrow buttons to select the desired Meal to be programmed. Press ENTER again if no other meal is needed. While setting the Meal or Meal Time if the process is not completed and no button is depressed for 2 minutes, changes are abandoned and it goes back into "Automatic Mode", retaining the previous Meal or Meal Time. Use the UP or DOWN arrow buttons to set Meal HOUR. Use the UP or DOWN arrow buttons to set Meal MINUTES. Press the ENTER button when minutes are set. The Menu will automatically take you to the "Meal Size" programming. Use the UP or DOWN arrow buttons to increase or decrease amount of food to be dispensed. Press ENTER upon completion. NOTE: Each bar equals approximately 1/4 cup. The maximum meal size you may select is 3 cups on either the 5 lb unit and the 10 lb unit. Continue setting remaining meal times and sizes until complete. Press ENTER after all meals are set, to complete programming. "SERVED" will show on screen at all times. This indicates the number of meals served. Meals served will go up to 99 and then reset to 00. To reset the "SERVED" counter, press UP and DOWN arrow buttons simultaneously and it will reset to 00. Press and hold the UP arrow button for 3 seconds. Food will be dispensed according to first meal set. Repeat if additional food is desired. When the "LOW BATTERY" warning light is on or before leaving for an extended period of time, replace all batteries. Set the clock to the current time. NOTE: Meal Programming is stored and will NOT need to be reprogrammed after the batteries are replaced. Product Materials:Removable plastic food hopper, Twist-off plastic lid, Electronic base with programming buttons and LCD screen, Removable food bowl.